The drive–in cinema is an icon of the 20th century. 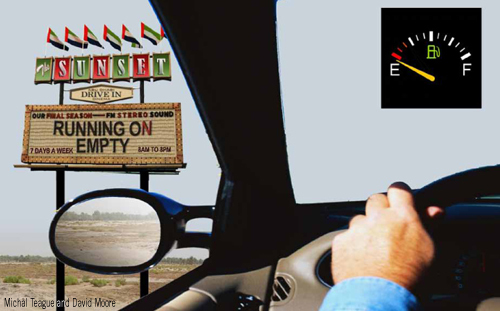 Sunset (running on empty) acts as a counter-monument marking the sunset of large petrol-guzzling cars. A drive-in cinema is an artefact from a carefree era, before knowledge of climate change and the finite nature of carbon-based resources. The word ‘Sunset’ refers to the end of the day, and the inevitability of change, it is also commonly used to describe an era that is coming to a close, as well as being a popular name during the heyday of the drive-in cinema. The drive-in cinema initially seems deliberately out of context in the UAE. A nostalgic folly from another time and place. However, it speaks to the global and interrelated nature of the need to adopt clean and renewable energy sources. Drive-in cinemas were traditionally sited on the outskirts of a city with easy access to a main roadway similar to the conditions existing at Site 3 Abu Dhabi. The advent of the VCR and increasing land value, meant that many have now become shopping centres and housing developments. The drive-in like oil is becoming scarcer, there now being only 700 odd left in the world. Video installation–a car is filled with petrol then starts its final drive in and around Abu Dhabi. The drive is documented until the petrol is finally used up, eventually coming to rest at its final parking site the Sunset drive-in cinema. Screen – known in the original vernacular as a ‘sheet.’A large outdoor screen powered by an open solar field. It is envisaged the screen will be placed in a westerly direction on site, approximating where the sunsets. Marquee–an illuminated sign advertising the session times of the film ‘Running on Empty’ to people passing the site.The title can be interpreted literally as referring to the fuel gauge of a car and more broadly fossil fuels becoming scarcer. Additionally nuance comes from the two ‘coming of age’ genre films both titled ‘Running On Empty’. An Australian film made in 1982 featuring a young man involved in street drag racing and a 1988 U.S. production about a fugitive family on the run from the FBI and the eldest son seeking to live a life of his own. Parked car – the ordinary car is permanently parked on site in the midst of the electricity-generating field after featuring in the video production. Ramps– a replica of a Drive-in Cinema car parking area laid in a fan-shape. Rather than the more traditional material of asphalt it will be anelectricity-generatingfield with the solitary car, mutely watching itself on screen. Option A: The preferred technological option for this component of the installation is to use Solar Roadway technology currently undergoing prototyping in the U.S. Having communicated with the developers full-production is probably 2 years off. However it would provide the option of the audience being able to safely walk or even drive on the electricity-generating surface. The product can also have LED lights embedded to create patterns, images and text. In respect to dust and sand, it will be able to be cleaned when required using a street sweeper. Option B: a ‘car ramp’ formed by a black field of currently commercially available photovoltaic solar panels. The dominant features of Site 3 Abu Dhabi – Airport Road near the Masdar City Site, are the surrounding roadways that delineate its boundary. The art installation foregrounds the role of the car and human behaviours, which influence the site, just as much as the naturally occurring phenomena – wind, sun, wildlife, vegetation, and occasionally water. In this way, the drive-in cinema installation is truthfully integrated into the surrounding environment and landscape. The solar electricity-generating field will cause minimal interference with the ground of the site. The natural vegetation of the site would be permitted to grow in and around the art installation to enhance the feeling of it being an abandoned place from another time.He design uses a portion rather than the whole site. Solar roadway 300 panels would generate 2.28MWhr – based on 15 % efficiency and a conservative 4 hours of sun per day. While 500 panels would produce an estimated 3.8MWhr. The project design aims to be accessible to pedestrian foot traffic. With the solar roadway technology there is the potential for it to become a playground for the public. This would occur by using the embedded LED lighting to create games and maze designs for example.